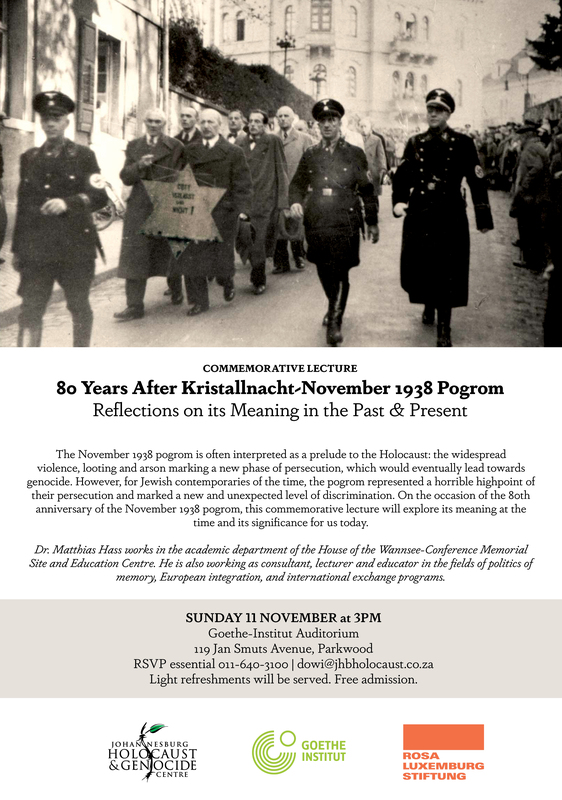 On Thursday, 8 November at 18.30, we will have a special lecture for the ITJ programme at the Johannesburg Holocaust and Genocide centre, learning about the Shoah. The lecture includes a guided tour through the exhibition at the centre. The lecture is open for all members of Bet David, but RSVP to the office is necessary: admin1@betdavid.org.za. On Sunday, 11 November at 15.00, the Holocaust Centre and the Goethe Insitute will hold its annual commemorative lecture. Our Bet David Choir will sing as part of the programme. Details about the lecture and how you can register can be found below. The event is free of charge.